Ticket books Disneyland began offering ticket books to guests on October 11, 1955. The first books cost $2.50 for an adult for a day at the park, and consisted of A, B, and C tickets for the different attractions. 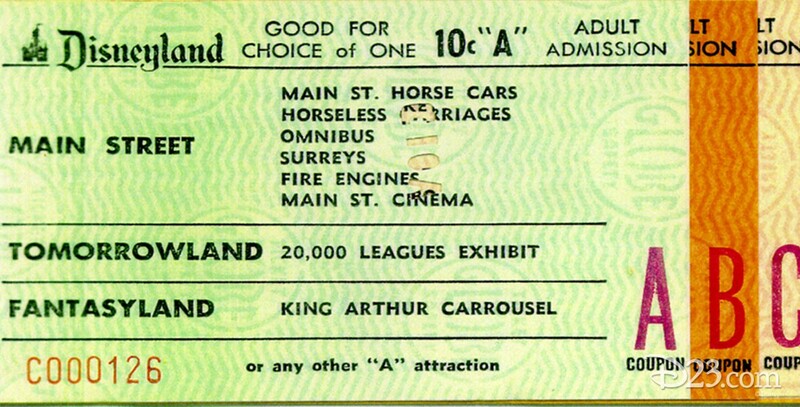 A D ticket was added in 1956 and an E ticket in 1959. Ticket books were phased out in favor of all-inclusive passports in 1982. Tokyo Disneyland continued to utilize ticket books until March 31, 2001. Annual passports were available at Walt Disney World starting on September 28, 1982; at Disneyland they were first offered to Magic Kingdom Club members exclusively in June 1983, but in the following year they were made available to all guests. See also E ticket.